The Urals-Okhotsk fold belt presents one of the largest fold belts of the Earth, stretching for almost 6000 km and its width from several hundred to 2000 km. The belt is located between the East European, Siberian, Tarim, and Chinese ancient platforms and in its composition we can distinguish the fold structures of the Riphean, Baikalian, Salairian, Caledonian, and Hercynian, locally overlapped by the horizontal cover of Mesozoic and Cenozoic sediments, forming the young West Siberian and Turanian Plates. Southwards of the Aral Sea the fold structures of the belt are linked together with similar ones of the exterior zone, and from another, the Mediterranean belt (Koronovsky, 1984). At present, most fold areas of the Urals-Okhotsk belt have mountain relief, formed as a result of powerful tectonic movements in the late Cenozoic (Strecker et al., 1995). Within the boundaries of the FSU an almost complete cross-section of the belt is observed, starting from the Siberian platform in the north-east and finishing with the Tarim platform in the south-west. Areas of Riphean folding form part of its structure along the south-western margin of the Siberian platform and the Baikalian fold area, located within the edge zones of the belt. In the extreme north-west, the Baikalian basement is formed by the Timan-Pechora Plate and its extension to the coastal area of the Barents Sea. However, we cannot exclude a more ancient than Baikalian age for the plate basement, dissected by the system of aulacogenes, formed by the Riphean, and partially, Paleozoic sediments. The baikalids are widely spread along the south-west periphery of the Siberian platform, where they form the Yenisey—Eastern Sayan and Baikal-Nizhnevitimsk systems (Volobuev, 1993). Vast areas of the belt are occupied by the Salairian and Caledonian fold structures. To the first, we assign the Kuznetsky Alatau, Mountainous (Gornaya) Shoria, and the eastern part of the Eastern Sayan, within which the folding took place in the middle Cambrian. 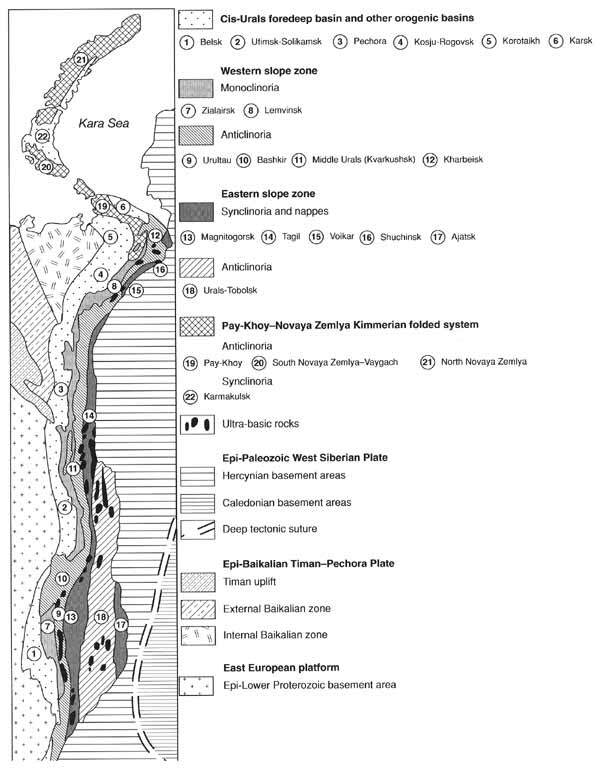 Caledonian structures occupy the central part of the belt, forming the vast Central Kazakhstan-North Tien-Shan massif, the marginal portions of which are overlapped by the platform sheet of Mesozoic and Cenozoic sediments. Eastwards, the Caledonides are bounded by the younger Hercynian fold areas (Khain and Seslavinsky, 1991). In the west, are the structures of the Urals, Pay-Khoy, Vayghach, and Novaya Zemlya. In the south, the southern Tien-Shan contacts the structures of the Urals beneath the cover of the Turanian Plate. The Hercynian fold structures of the Dzhungar-Balkhash area, Irtysh-Zaisan, Ore (Rudny) Altay, Tom-Kolyvan, and Salair systems, as well as the part of the Altay, are eastwards of the Caledonian massif. A number of these fold systems extend to the north, to the boundaries of the West Siberian and Turanian Plates. Within the limits of the Urals-Okhotsk belt the spatial positioning of the fold areas and systems of various ages is rather intricate. Along the belt edges they mainly form the linear systems of the Urals type, stretching for thousands of kilometres. At the same time, within the inner parts of the belt, the arcuate, oval fold systems are represented (e.g., in Central Kazakhstan). Within the Altay-Sayan region, side joinings of the fold systems are often found (Mossakovsky et al., 1993). This distribution of fold structures results from the great number of massifs of the ancient, obviously Cambrian consolidation of microcontinents. Within the belt, the ophiolite zones are extensively developed, as well as cover and fold-thrust fault scaly structures, which occurred as a result of the closing of the basins with ocean-type crust, accompanied by subduction processes, island arc and margin sea formation (Grishin et al, 1997; Kurenkov and Aristov, 1995). The most typical linear fold system of the Urals-Okhotsk belt is that of the Urals, subdivided into a number of narrow meridional structural zones (Figure 1.7). Within the Urals, two main complexes of sediments can be distinguished, pre-uralides (lower Proterozoic-Riphean) and uralides (Ordovician-end of the Paleozoic). The first is formed by the most ancient gneisses and crystal schists, overlapped by the thick, up to 15 km, series of the Riphean sandy-clayey and carbonate Riphean and molasse Vendian sediments. The second is the thickest, with fades very different from those of the uralides proper. The western zone of the Urals was formed on the downthrown edge of the East European platform and represents an ancient passive continental margin, within the boundaries of which a thick complex of sedimentary terrigenous and carbonate deposits accumulated, beginning in the Ordovician and ending in the middle Carboniferous. The eastern slope zone, consisting of a number of special linear structures, is characterized by a widespread development of volcanogenic rocks of island arc type and ophiolites, usually deposited within the cover structures. Volcanogenic-sedimentary complexes and ophiolites of the eastern zone locally overlap tectonically the sedimentary series of the western zone, the sediments of which are also crumpled into folds, and thrust towards the west forming the complex system of the cover structures. In a number of areas of the eastern zone almost non-deformed relicts of genuine ocean crust are preserved, suggesting the presence of former ocean basins, divided by microcontinents and closed in the middle and late Paleozoic (Puchkov, 1993). The subduction processes were accompanied by formation of the island arc calc-alkaline volcanic series, brought close together along the present thrust faults and often overlapping each other (Yazeva and Bochkarev, 1993, 1995). At the beginning of the Carboniferous, continental coarse clastic molasses were formed, suggesting a dissected mountainous relief. Ahead of the front of the growing mountains at the end of the late Carboniferous, at the boundary with the East European platform, the Cis-Urals foredeep was deposited. It developed in the Permian and in the north up to the early Triassic. It was formed by a thick molasse, which in the south was salt-bearing, whereas in the north it was coal-bearing. From the west, the basin was limited by the chain of the lower Permian reefy massifs and the coarseness of molasses decreased from east to west. Modern seismic data suggest that there are a great number of thrust faults within the Urals structure, formed at depth and often transforming into layer-by-layer detachments (Kazantsev et al, 1996). The eastern part of the Urals is overlapped by the cover of the West Siberian Plate, the biggest plate within the limits of the Urals-Okhotsk fold belt, occupying an area of more than 3.5 million km2 (Figure 1.8). 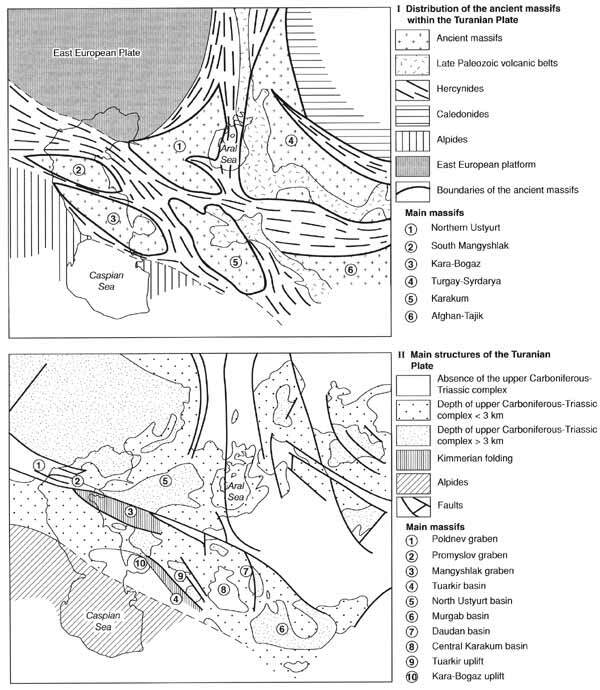 The plate basement is heterogenous, consisting of both extensive blocks (microcontinents of the pre-Riphean consolidation) and of fold zones, which closed at different times (Baikalian, Salairian, Caledonian, and Hercynian). Between the basement of the West Siberian Plate and the genuine cover, beginning from the lower crust, the intermediate complex is located, often deposited in grabens of Triassic age and formed in its lower part by basalts, whereas in the upper part it is formed by the sandy-clayey coal-bearing series, with a thickness of up to 5 km (Koronovsky, 1984; Khain and Balykhovsky, 1993). The tectonic movements of the end of the Hercynian stage in the middle Triassic were accompanied by the extension of the plate with the formation of numerous grabens, composed of molasse, including coal-bearing rocks, as well as basalt volcanites. These grabens inherited the weakened fault-line zones of the fold basement. However, these grabens, because the plate stood high, were predominantly formed within the zone of the Cis-Urals hercynides and within the limits of the Ob-Zaisan zone. Most of the narrow grabens and graben-shaped basins, related to dome uplifts, are formed by the volcanogenic-sedimentary Triassic deposits, represented by thick sheets of basalts, dolerites, diabases, andesite-basalts, rarely liparites and their tuffs, interlayered with conglomerates, and in the basement by the sandstones, aleurolites, and argillites. All the volcanogenic formations are of the typical trap formation type, though alkaline basalts are also found. Upwards, the Chelyabinsk series of the middle Triassic to the lower part of the Lias are deposited inconsistently, and are composed of sandy-clayey rocks with stone coal interlayers. The total thickness of the deposits of the two series can reach 5 km. Locally, the lower and middle Jurassic coal-bearing terrigenous rocks are also deposited within the grabens. The absolute age of the basalts of the Tyumen region totals 242-256 million years, and in the tuffltes, ganoid fishscales are found, which suggests a late Permian age for the base of the stratigraphic sequence of these sediments. At the same time, in the north-east of the plate, the extensive Yamal-Tazovsk basin was forming, with marine clayey sediments (up to 2 km thick in its northern part, and southwards, clayey-sandy ones of 0.5-0.8 km thick). Within the southern regions, separate fields of similar sediments are recognized, synchronous with the Turanian series in their age. The platform cover of the Mesozoic (beginning at the lower Jurassic) and Cenozoic, up to the Quaternary sediments, has an exclusively terrigenous composition (Surkov and Zhero, 1981). The platform cover sediments on the West Siberian Plate begin, by and large, with the Jurassic. However, in different regions the lower boundary of the cover occurs at a different level along the stratigraphic sequence, beginning from the Lias in the north and up to the upper Jurassic in the south. The cover is represented by continental and marine sediments, mainly terrigenous, although marine sediments are predominant in the north. Towards the south, west, and east they give way to primarily littoral-marine sediments, and then to continental. The varied facies of the Jurassic sequence (Lias to early upper Jurassic) are located at the cover basement and are represented at the margins by sandy-clayey, often coal-bearing sediments, giving way to the marine polymictic sands and sandstones in a northerly direction. The thickness of this sequence totals 1.0-1.5 km. The sediments of the upper parts of the lower Cretaceous and upper Cretaceous over most of the plate are represented by marine facies. The whole sequence within the separate basins amounts to a thickness of 1.5 km. In other places, it reaches 0.5-0.6 km and is formed exclusively by terrigenous rocks: sandstones and sands (rather commonly glauconitic), aleurolites, argillites, and clays. The Paleogene sediments, up to the middle Oligocene, have been studied both at natural outcrops and by numerous boreholes. In the centre and west of the plate they are predominantly marine, shallow water terrigenous rocks: clays, argillites, quartz-glauconitic and glauconitic sands and sandstones, rarely diatomites, and silica clays. Along the periphery of the plate the thickness of the Paleogene sediments amounts to tens or some hundreds of metres, and in the central regions they increase by 0.5-0.6 km. Beginning from the middle Oligocene continental conditions on the territory of the plate were established and it was transformed into a lacustrine-alluvial plain. In the middle and late Oligocene, sandy-clayey continental sediments with interlayers of lignites of about 0.2 km in thickness, accumulated. A similar type of sedimentation characterized the Miocene and early Pliocene. Therefore, sometimes the sediments of the middle Oligocene-lower Pliocene can be combined into a single continental series (the Irtysh series), within which a number of suites can be distinguished. Their thickness varies from some tens of metres to 0.5 km. The sediments of the upper zones of the Pliocene-Quaternary form a horizontally extensive sheet, deposited over Paleogene and even Cretaceous rocks. This sheet occupies almost all the surface of the plate, has a maximum thickness of up to 0.2 km and is represented by various types of sediments: glacial, fluvioglacial, lacustrine, lacustrine-boggy, alluvial, marine, and glacial-marine. The sandstones within the cover are a good reservoir for oil and gas, and the clayey layers serve as cap rocks. The West Siberian Plate contains Russia's major deposits of oil (Jurassic) and gas (upper Cretaceous). The fold structures of the Urals-Okhotsk belt continue along the limits of the Kazakh Knolls, the northern and southern Tien-Shan, Altay, and Eastern Sayan. They extend in the south into the limits of Mongolia, where, gaining a sublatitudinal strike, they reappear within the boundaries of Russia, in eastern Transbaikalia, in the middle course of the Amur river and the Sea of Okhotsk coast (Biske, 1995; Leonov, 1996). A characteristic of the easternmost part of the Urals-Okhotsk belt is the presence of a number of pre-Paleozoic massifs (Argun and Bureya) and fold zones of both Paleozoic and Mesozoic age. The predominantly terrigenous rocks were subjected to pre-late Cretaceous folding in the east, whereas in late Cretaceous times molasse basins and volcanic belts were formed. Thus, the eastern sides of the Urals-Okhotsk belt are under the influence of the Pacific belts. The Urals-Okhotsk belt is surrounded by ancient pre-Riphean platforms on almost all sides (East European, Siberian, Chinese, and Tarim). The important role of extensive blocks of Archean and lower Proterozoic rocks within the belt structure is revealed. 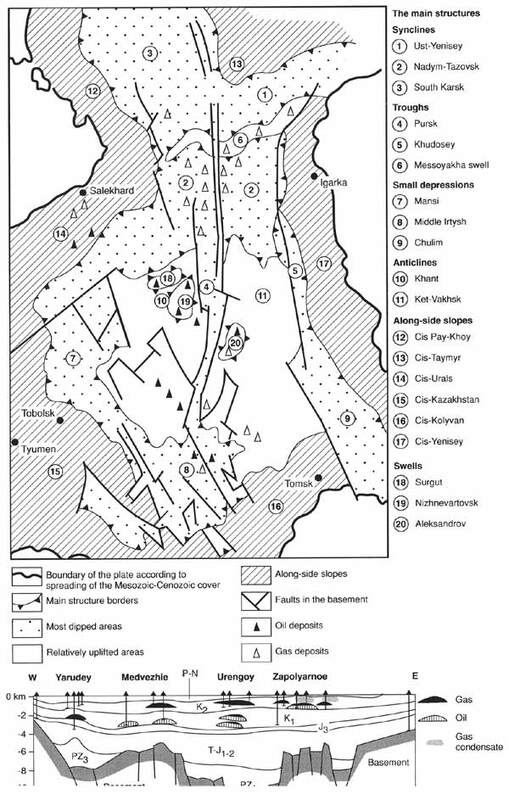 In a number of sites (on the Turanian and West Siberian Plates and in Transbaikalia) these blocks occupy such a vast area, that the Baikalian and Paleozoic fold structures present only narrow zones, relating to the major net of faults (Figure 1.9). All this enables one to suggest that the Urals-Mongolian belt was deposited in the Riphean on the split gigantic protoplatform of the Archean and early Proterozoic fold basement (Khain and Koronovsky, 1995). The splitting of the continental crust was not uniform everywhere, and was probably most significant in the central axial part of the belt. The Salairian, Caledonian, and Hercynian mobile systems had to accommodate themselves to the mosaic of the rigid blocks (Fedorovsky et al, 1995). This explains the intricate pattern of the fold structures (e.g., within the Altay-Sayan area and in Central Kazakhstan). For Central Kazakhstan and northern Tien-Shan the typical structural pattern consists of arcuate fold zones, oval and semi-oval in shape (Bazhenov and Burtman, 1997). The general rejuvenation of the fold systems from the edge of the Siberian platform in the direction of Zaisan zone, where folding occurred in the middle Carboniferous, should be noted. The transverse cross-section of the belt is fully included into the boundaries of Russia. Visually, therefore, one can trace a most important characteristic, consisting of the migration of the folding from the outer to the inner zones. The geological survey of the fold structure demonstrated that the tectonic nature of its northern and eastern sectors is not yet fully studied. In the north, the belt is evidently degenerating, and in essence, it terminates in the Polar Urals structures, which according to geophysical data rapidly dwindle towards the north-east beneath the cover of the West Siberian Plate. The Novaya Zemlya-Pay-Khoy fold system, although building the superstructures of the Urals, already has a specific character which identifies it with the Arctic fold belt. It also dwindles northwards, having an early Kimmerian age for its final folding. The northern half of the West Siberian Plate represents a pre-Riphean block, probably created during the Baikalian. The fold structures of Taymyr towards the south-west can no longer be traced in the geophysical data. A less complicated situation is observed in the east, where the development of the Urals-Okhotsk belt was under the significant influence of the Pacific belt with its specific style of tectonic development (Almukhamedov et al, 1996). The Mesozoic events essentially changed the geological pattern of this region, but the impact of the Riphean, and particularly Hercynian folding remained vivid. Consequently, within this region the juxtaposition or inter-penetration of the two belts with different tendencies of development occurs; it should be noted that further to the east the Pacific belt influence increases. The Urals-Okhotsk belt is distinguished by its extremely thick granitoid magmatism, accounting for the widespread nature of its ore deposits. Within the Urals-Okhotsk belt in the Mesozoic and Cenozoic two plates with a heterogenous basement were formed. At the early stages of its development this basement, which represented a mosaic of blocks of different ages of consolidation, was subjected to extension, with the formation of grabens and basins, in relation to which basic (trap) volcanism occurred somewhat actively. The typical platform cover over these plates began to form only from the early Jurassic. The peculiarity of the lithology of the cover sediments is the predominence of terrigenous rocks and the concentration of gigantic deposits of oil and gas. Over the young plates the degree of inheritance of the cover structures from the basement structures is considerably more than over the ancient structures. In addition, weak middle Jurassic and intense late Cenozoic tectonic activity within the limits of the southern and eastern parts of the belt resulted in the formation of the vast mountain belts of Central Asia and Southern Siberia (Bekker, 1996; Rogozin, 1993).